Live Hotmail was re-launched in the form on Outlook.com with all new user interface. Many users have already converted email addresses from @Hotmail.com to @Outlook.com ID. Even though storage space is not an issue while using @Outlook.com email service, there is always an urge to sort and view space hogging emails. While sorting Gmail emails by size has always been an issue, Outlook makes this super easy with a click of a button. 1. Login into your email account at Outlook.com (or login.live.com) website. By default, Outlook inbox should open displaying list of incoming email messages. 2. Click on Arrange By button at top right side and then click on Size option. It will display email messages in ascending order (increasing size) from top to bottom. 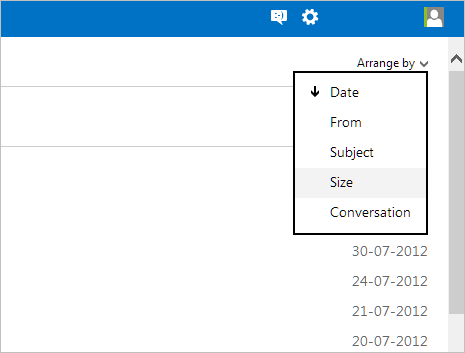 You can go to last page to view email messages with largest size contained in your Outlook inbox. By default, email messages are displayed by date. Outlook also provide more ways to arrange and view emails like Arrange by: From, Subject and Conversation. Arranging email messages by size is a handy option to quickly view big sized emails. This surely provide an easy option for cleaning up inbox of unnecessary large emails, atleast for users who love to be organized in the online world. On the contrary, if you do not delete large emails for years – there won’t be an issue as SkyDrive integration in Outlook (Hotmail) provide lot of free space for email messages with big size attachments.